The master keying of cylinder locks is essential for modern buildings, particularly large buildings that have a large number of locking doors and require the minimum number of keys. 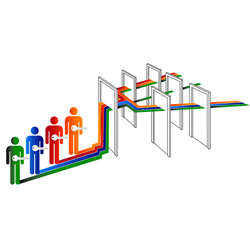 Doors used by the same people can be grouped together in a passing group so that all doors are operated by the same key, this further reduces the number of keys needed. The passing group can be part of a larger master key system or can be completely separate. 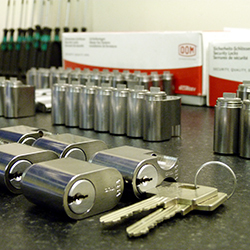 Our systems are calculated using the latest software, the calculations are sent to our networked cutting and stamping machines, all lock systems are checked before dispatch whether they are a 5 lock system or 20,000 lock system. 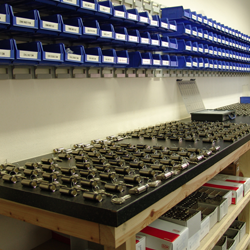 Each system we produce is registered to the owner and only authorised signatories can order additional keys and locks. The original idea for the modern pin tumbler lock goes back to Egyptian times, but our current security locks are much more complicated. Different size pins in multiple positions allow us to offer systems with billions of combinations ensuring no key crossover and extreme anti-pick features.